Almost one-in-five voting members of the House and Senate are a racial or ethnic minority, making the 115th U.S. Congress the most diverse in history. And while Congress as a whole remains disproportionately white when compared with the U.S. population, the racial and ethnic profile of newly elected members more closely resembles the increasingly diverse populace, according to a Pew Research Center analysis. Overall, nonwhites (including blacks, Hispanics, Asians/Pacific Islanders and Native Americans) make up 19% of the current Congress. By comparison, nonwhite Hispanics and other racial minorities make up 38% of the nation’s population. Minorities, however, account for 20 of 59 new members (34%) of the House and Senate. This represents a notable jump over the 114th Congress, when just 11 of 71 new members (15%) were a racial or ethnic minority and the Senate had no newly elected minority members. This year, three freshman senators are a racial or ethnic minority, along with 17 new members of the House. Diversity in Congress has been growing for decades, though it has lagged behind the diversity of the nation as a whole. In 1981, 6% of members of Congress were a minority, while the national population was about 20% nonwhite. When the 107th Congress took office in 2001, minorities accounted for 12% of all members, compared with about 31% of the nation’s population. 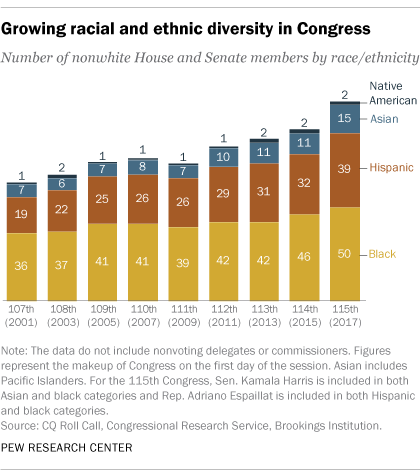 Among minority groups in Congress, the biggest growth over time has been among Hispanics and Asians, both of whom have doubled their representation in the national legislature since 2001. 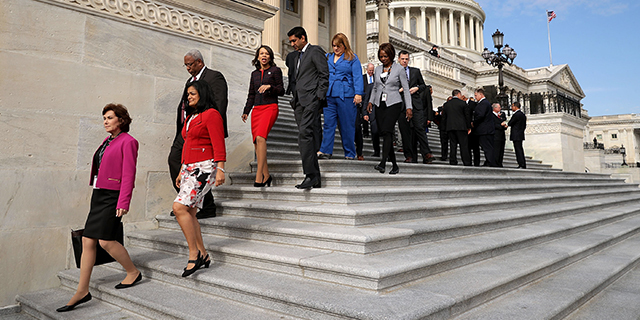 Today, there are 39 Hispanics and 15 Asians in office, up from 19 Hispanics and seven Asians in the 107th Congress. The increasing number of minorities in Congress is due largely to changes in the House, where today 95 of 435 members (22%) are nonwhite, according to CQ Roll Call. By comparison, there were 60 minorities in the House in 2001. In the Senate, 10 of 100 members now belong to a racial or ethnic minority group, up from three in 2001. House minority increases have largely come among newly elected Democrats, though Republicans have also seen an uptick. Since 2001, the number of House Democrats who are minorities increased by 27, from 56 then to 83 now. There was an increase of eight representatives among House Republicans over the same period, rising from four then to 12 now. Despite the increase in nonwhite representation in Congress, whites account for 81% of the current Congress but represent just 62% of the population. This gap has widened over time. 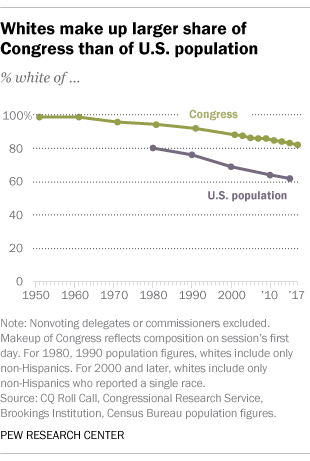 In 1981, 94% of Congress was white, compared with about 80% of the U.S. population. Correction: A previous version of this post gave an incorrect total for minority House members in the 115th Congress. The House totals by party remain correct. Note: For analysis of the previous Congress, see: 114th Congress is most diverse ever.